For those of you on the East Coast, White Castle is probably as common as a McDonalds or a Starbucks. But, not here on the westside. 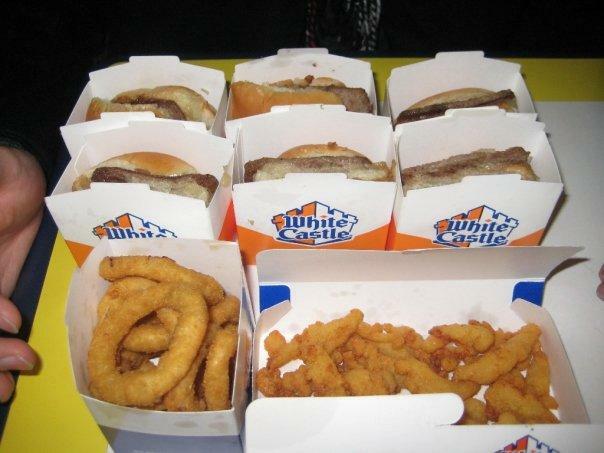 Ever since “Harold and Kumar Go to White Castle” came out, the fast food restaurant seemed like a mythical utopia of mini burgers and fries to us on this side of the world. On my trip to New York last year, White Castle was sadly a destination on our itinerary. We walked for miles to a real shady part of town to try the burgers. We ordered 6 jalapeno burgers, onion rings and clam strips. Anticipation rising, hearts pounding, mouths watering. I took my first bite into the hot, soft, tiny burger and it was…… disappointing. The meat was only a millimeter thick and there was a thick spread of mystery sauce. The bread was cold and soggy and I really didn’t taste any jalapeno in the meat. In conclusion, White Castle is just a hype. It’s got nothin’ on In ‘n Out.